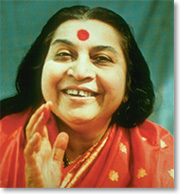 Sahaja Yoga - my encounter with Reality! "Her Holiness Mataji Shree Nirmala Devi"
Sahaja Yoga - the Comforter! Uptil the age of 18 I had made(atleast I thought) a great achievement. I had become an extremely clever person, a glib liar and a fluent tricker. And I sometimes congratulated myself over the artificial attitude. What I did'nt actually realize was the stress and gulty conscious that kept on building on me. But I did suffer from its vicious pangs. In the night, as a patient of insomnia I had become, I kept on devising strategies and plans for the future. In a phrase, "I became mentally sick and exhausted." At this time, when I walked into a Sahaja Yoga centre, I did'nt know that it would be a transforming experience - a tranformation for good. As I began practising it, an inner subtle force(the Holy Ghost) made out of me an innocent boy. All the stress, all the planning, all the tensions, all that insomnia; all GONE. Even, to my surprise, I became socially more acceptable. This new energy which I breathe through, the comforter, as the Holy Bible points out, can be attained by each and every one of us, without losing anything! "I request you to come into this beautiful world & transform yourself."